How to Fix "ERR_INTERNET_DISCONNECTED" Error in Google Chrome? 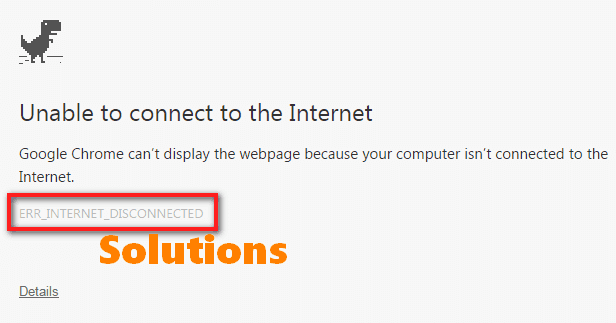 Home Error Solutions How to Quickly Fix “ERR INTERNET DISCONNECTED” Error in Google Chrome? How to Quickly Solve “ERR INTERNET DISCONNECTED” Error in Google Chrome? – So you are facing this common error in your internet browser frequently. Well, not an issue after you finish up following what’s given here. ERR_INTERNET_DISCONNECTED is one of the errors which occurs due to misconfiguration of Internet Network or Connection. It is similar to the other errors such as DNS PROBE FINISHED NXDOMAIN, etc. 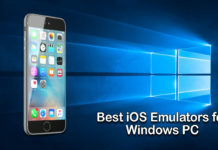 It is commonly faced by Google Chrome Users in Smartphones or PC (Windows 10/8/7 or MAC). You can fix it following easy methods listed below. We will go through each method step by step so that it’s easy for anyone to understand and follow. 1.1 What is ERR_INTERNET_DISCONNECTED Error? So what actually is ERR INTERNET DISCONNECTED and what’s the cause of this error? 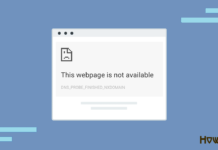 ERR_INTERNET_DISCONNECTED is a Google Chrome Error frequently caused due to mis-configuration of network or sometimes due to Caches and Cookies. This error popups when you frequently visit any website or frequently keep changing the Internet Network you are using. This error occurs and popups usually in Google Chrome or even sometimes in other internet browsers like Firefox. We will see Solutions to Resolve this Error in any Internet Browser. 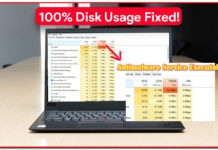 RECOMMENDED – How to Fix Service Host Local System Using Up All the Resources? Let’s now see each solution one by one. So before doing anything other, check your internet connection status. Since the error, ERR INTERNET DISCONNECTED deals with Internet Connection, it’s possible that your Internet Connection might be incorrect or disconnected. Just check the Status of your internet connection, network device or router. Check whether you are connected to the Network you intent to connect with. Also, check if your internet router is correctly configured. Once you check all these things and if it seems to be no issue with your internet connection then you may proceed to other solutions. Sometimes, Clearing Internet Browser Data like Caches, Cookies or History may solve the Google Chrome error ERR_INTERNET_DISCONNETED. This method is also useful to fix ERR_CACHE_MISS Error. So just follow the steps to Clear Caches and Cookies of Google Chrome. 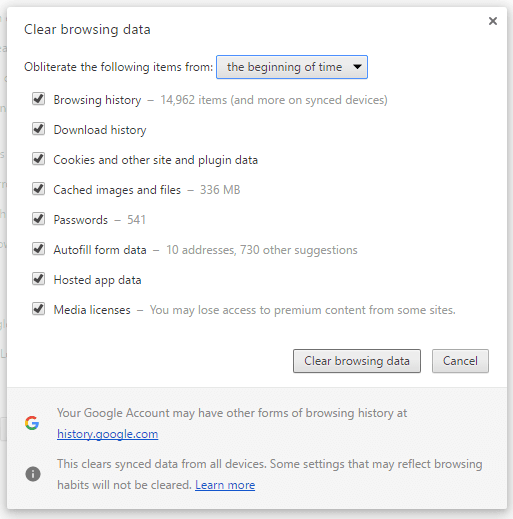 ALERT: This method will clear all your saved data in Google Chrome i.e., Saved Password, Autofill forms, History, etc. So proceed ahead with caution. 1. Open Google Chrome & Copy the given link. 2. Paste the Link in New tab and click Enter. 3. A pop-up will appear asking which things to clear. Just select all the options that are there on the popup screen. Select “the beginning of time” in “Obliterate the following items from:“option. 4. Then, click on Clear browsing data button. 5. That’s it. Check now, ERR_INTERNET_DISCONNECTED Error is most probably solved. If still the error persists, you may try out the other solutions. YOU MAY ALSO LIKE – How to Completely Remove Avast SafePrice Extension from Any Browser? 1. 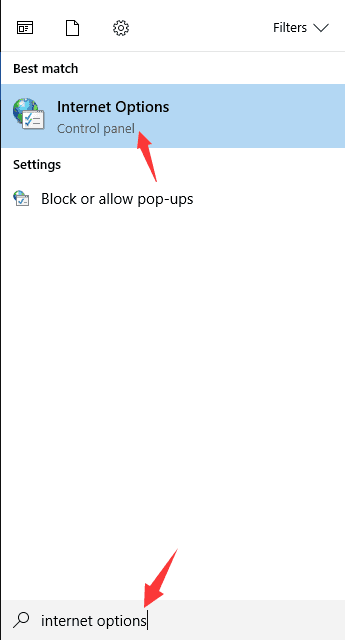 Press Windows key and type Internet Options in the search bar. 2. Open Internet Options and go to Connections tab. Click on LAN settings. 3. 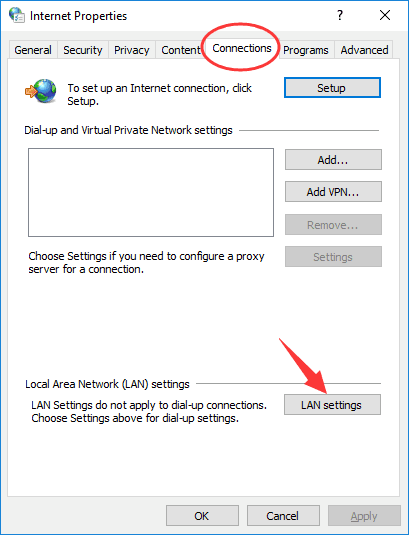 LAN Settings window with few options will pop up. Just make sure the two options, “Automatically detect settings” and “Use a proxy server for your LAN” are deselected. Press OK once you make the changes. 4. That’s it. We have fixed and modified the Automatic LAN Settings Detection and if this setting was causing err internet disconnected issue or error for you then probably its resolved now. Check to see the results. You can follow other methods or solutions for err_internet_disconnected error if you are still facing it. 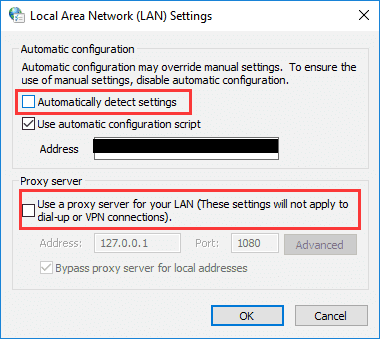 CHECKOUT – How to Fix “DNS Server Not Responding” Error in Windows 10, 8 or 7? Sometimes, an Antivirus Program or any other Security Software like Firewall may be responsible for the cause of the Error ERR_INTERNET_DISCONNECTED due to the fact that it interferes with the settings or security of your Computer. Antivirus or Default Firewall on your computer may interfere your access to the internet in some cases. So we can temporarily disable or stop that software to check if the error gets vanished. Just open your Firewall Settings or Security Software or Antivirus Settings, Disable it for Few Minutes or Uninstall them temporarily. Now try accessing the internet. If the error seems to be resolved then this security software or programs were the cause of the error. So you may think to change the security software you were using or stop using them to avoid getting the ERR_INTERNET_DISCONNECTED error permanently. If you still continue seeing the error even after disable or removing security software then the cause of the error is probably something else. So again enable that software and carry on trying other available solutions. ALSO READ – How to Fix “Unfortunately Google Play Services Has Stopped” Error? 2. A Command Prompt window will popup. 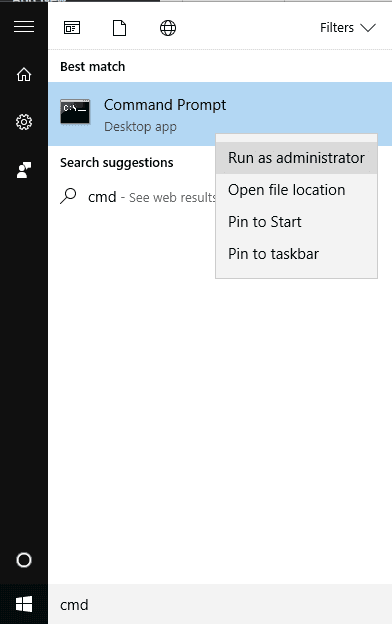 Just enter the given below Commands & run them one by one in Command prompt. You can Copy the Command given below & paste it in Command Prompt & Press Enter to run them. Now try surfing the internet through Google Chrome. Most probably the ERR_INTERNET_DISCONNECTED error would have fixed and disappeared. How to Fix ERR_SPDY_PROTOCOL_ERROR Chrome Error? How to Fix DNS_PROBE_FINISHED_NO_INTERNET Error? How to Fix ERR_EMPTY_RESPONSE Chrome Error? Hope this Guide helps you fix the issue with your internet connection and help you get rid of the ERR_INTERNET_DISCONNECTED error. This guide is compiled of few number of tested and working solutions with the step-by-step detailed guide with images of each solution. We will be updating this Guide with more working solutions and update to the existing solutions. You may comment below your queries or any other questions (if any). Cheers!